Adds icons to the weapons of Weaponsmith Extended, as well as a few icons for New Calibers and sorting with Valdacil's Item Sorting. Currently abandoned, you are free to update or do what you wish with this mod. However assets and originals are all credit to their owners. UPDATE 5/19/17: Unfortunately, life hasn't left me with a lot of time to mod and so this is currently abandoned. However anyone is free to update or use this as you wish and do whatever you want with. I may revisit it in the future when things change, but for now, this is left as is. It does currently cause issues with the latest version of WSE, but there is a link in the comments to a version that works. Thanks for all the support everyone and hope to see you all again! Just a simple patch to add icons to the many wonderful weapons added by Weaponsmith Extended as well as adding icons to a few things from New Calibers, so as to create a more streamlined inventory experience. The other items that have added icons are the various barrel sets and conversion kits from New Calibers. They did not have icons before, and this just adds a tool icon to them for aesthetics. PLEASE NOTE: My patch does nothing but add the tags to the weapons. Everything else is done by the other mods required by this one. Also, all icon decisions were based on how the gun looks, and by a guns functions. I was limited on icon choices, but plan on adding more icons in a future release. Feel free to give suggestions on icon changes, or anything else for future updates. The method I used in this was a simple workaround that works well and doesn't clash with how WE works. Unfortunately this means that this patch will only work on the weapons included in Weaponsmith Extended and not any other weapon mods. I recommend loading my mod towards the end, as it modifies instance naming for weapons to achieve the affect. Anything that overrides dn_CommonMelee or dn_CommonGun should be loaded before mine if you wish to keep the icons. This is currently a work in progress, and all chosen icons were done to closely match the gun. Anything that can be a pistol or a rifle will use a rifle icon since hot swapping icons doesnt work, and I used a few pistol icons for guns of a different type. (The laser pistol icon looks like a heady pistol revolver, so I used its icon to signify such.) There are a few guns that may need switching, and I am open to suggestions. 1. Make sure pre-requisites are installed. 1. Install either with your Mod Manager of choice, or extract to your Fallout 4/Data directory. 2. 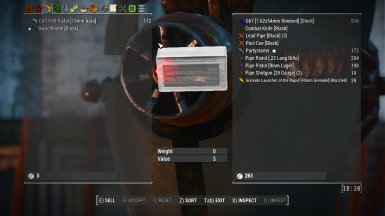 Make sure my file loads after Weaponsmith and near the end of your load order, or at least after any other mods that modify instance naming, else it may remove the tags for icons.